The Kentucky State Police operates under a number of core values and principles. These are embodied in a number of codes and statements, including: the official Code of Ethics for all sworn officers; the Kentucky State Police Vision Statement; the Kentucky State Police Mission Statement; and the Kentucky State Police Goals and Objectives Statement. Our dedication and strict adherence to our core values and principles ensures that the Kentucky State Police will remain a detail-oriented, efficient and professional law enforcement agency in service to the citizens of the Commonwealth of Kentucky. 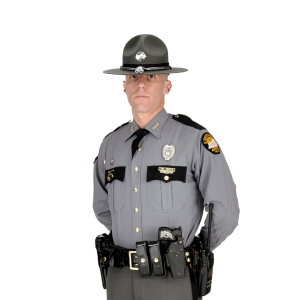 The Kentucky State Police strives to maintain the highest standards of excellence utilizing training and technology to create a safe environment for citizens and to continue as a national leader in law enforcement. Safeguard property and protect individual rights. GOAL 1: Human Resource Development – Provide a highly motivated and competent workforce to deliver police services to citizens of the Commonwealth. GOAL 2: Highway Safety – Reduce the number of traffic crashes involving injury and death on Kentucky’s highways. GOAL 3: Reduce/Prevent Crime – Contribute to the creation of safe communities by initiating efforts to reduce and prevent crime in rural Kentucky. GOAL 4: Criminal Justice Support – To provide technical and logistic support to Kentucky State Police and other criminal justice agencies. GOAL 5: Commercial Vehicle Enforcement – Promote the safety of Kentucky highways through commercial vehicle initiatives, driver and vehicle inspections, enforcement, compliance reviews, and education.